The best way to celebrate your 50th birthday. A couple of years ago I had a weak moment were I promised my whiskyfriends that when I turn 50 we will have a tasting with whisky distilled in 1965. Now when that day was here I had to stand up to what I have promised so I invited my friends. 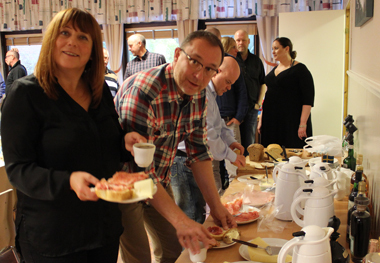 40 of them said yes to my invitation so it was a good bunch that came to Påarp October 31 2015. My birthday was actually on October 20th, but that day I was in New York with my wife to celebrate the day in the city I love. My guest started to arrive around 1 PM and then we had a starter to kick off the day. Coffee and cake was of course a must when it's birthday celebrations, but the day was also about whisky so with the coffee I served a blended whisky called Tayside. It was a 12 year old that was bottled in a ceramic decanter in 1977 for the Queen's Silver Jubilee. 1977 minus 12 is 1965, so I thought it was a good start of the day that was ahead of us. It turned out to be a great start! Lovley coconut and vanilla in it, so it went well with the cake. When the coffee and cake was eaten it was time for flight number 1. 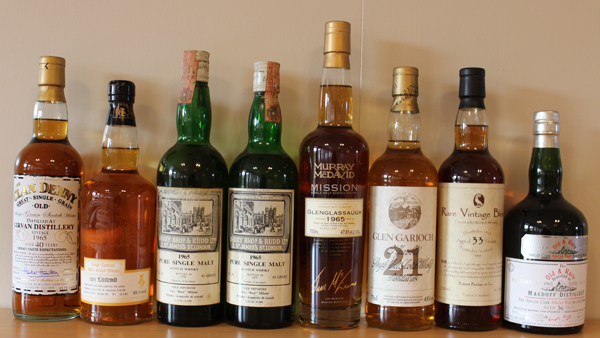 The first 8 whiskies from 1965 were ready to be tasted and evaluated. As usual when I do big tastings I had tried to make flight number 1 a good one, flight 2 the best one and flight 3 hopefully a decent one. As I hadn't tried them all before it was a bit of a guessing game, but it turned out that I hade managed to do it as I was hoping to. 320 glasses of whisky were poured and everone looked forward to a long and fun day with some nice whiskies with great friends. As this was a party more than a tasting there were no tasting hosts to talk about whisky, distilleries etc. No tasting host I have ever met can compete with the combined knowledge of the people in that room that day. So instead of sitting back and listening to someone talking about whisky we dove right into the tasting of the whiskies. As the room was full of whiskynerds it only took like 3 seconds before the discussions were going on. Most of the people there already knew each other, but some made new friends this day, so we all had a lot to talk about while enjoying the first 8 whiskies of the day. After about 2 hours of tasting and talkin it was time to reveal what was in the glasses. Some had already peaked at the bottles, while others wanted to try them blind. We also had a quick voting after each flight to determine the winner in each flight. 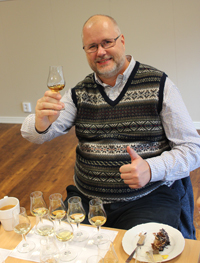 The first session was a mixed one with blended whisky, single grain and single malt. The youngest one was only 13 years old and the oldest one was 40 years old. As number 2 there was a somewhat special bottle, a Littlemill that was distilled only 5 days after I was born! That was the bottle that was closest to my birthday I had found. I have been looking for 10 years for a bottle distilled on October 20th 1965, but haven't succeeded. The two youngest ones were from Berry Bros, Berry Bros Single Malt 1965 to 1978 and 1965 to 1979 were the ones that didn't really reached the level of the other whiskies in this fligh. I had pretty high hopes for them, but they still reached 84 and 85 points in my book, so not that bad. The big disappointment was the Glen Garioch 21. I have tasted other bottles of this one that were better, but the cork on this one wasn't pretty, so maybe it has gotten damaged by that. 90 points only in my book. The winner was actually the blended whisky! A vintage 1965, 33 year old blend, so not really your average day blend. In a close second place we had the Glenglassaugh. It was time for a food break. Glasses had to be washed and we all needed some coffee and sandwiches. And cake of course! Maja and Benny digging in on the food. There must be time for a small cigar too, right? When we had gotten enough food to be able to enjoy some more whiskies it was time for flight number 2. Now I was hoping that I had made the correct choices for this flight as I wanted a flight with 8 very good whiskies . Would they deliver? Oh yes, they did! It was 8 single malts that should show us what they were made of. The youngest one was a 12-year old Glenlivet and the oldest one was a Strathisla bottled in 2011, so at least 45 years old, maybe 46. It started very good with a very nice St Magdalene from Connoissuers Choice and the young Glenlivet did a great job competing with a lot older whiskies. The Highland Park from 26.10 (only 6 days from my birthday) was good too, but then the bar was raised to a whole new level with Probably Speyside Finest (Glenfarclas) and the 4 last ones all got 92-93 points from me. The 30 year old Springbank from SMWS was my personal winner, but the Glen Grant from Signatory was not far behind. Bruichladdich Legacy Two and Strahtisla were the last two in that quadruple of great whiskies and it wasn't far from cheering in the room when we tasted these. This was a flight to remember a long time. Now we had tasted 17 st whiskies so it was time for some real food. A cold buffet from Backen Catering in Påarp did the trick. Chicken, pork, pastrami, german potatoesalad, Västerbottenpie, pastasalad and bread was ackompanied by some goodies to the coffee in form Armagnac de Montal 1965 and Calvados Coeur de Lion 1965. The mood was great when it was time for flight 3, but then my friend Hasse Peters interrupted and said that it's no real birthdayparty without presents, so it was time for opening presents! Everyone at the party knows me too well so you could very quick see a pattern in what was in those presents. Alcohol and cigars dominted in the presents, too many cigars if you ask my wife, but not if you ask me! 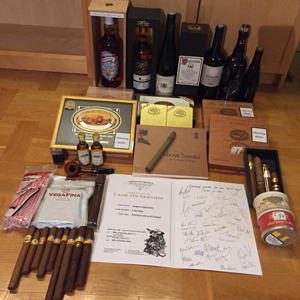 I got a bunch of interesting cigars, but also a 50-year old whisky distilled in 1965, a bottle ogf wine from 1965, a pipe (as old men smoke pipes), another 2 bottles of whisky, some fun beers and a gift card from Bredaryds Wärdshus, Sweden's best place for food, whisky and beer! As if this wasn't enough, Hasse came at the end with a big birthday card which held a owner certificate of a Sherryoctave, peated sprit from Ardnamurchan, Adelphis new distillery! And that wasn't the ned of the presents! Robert K had a cigar from a box his granddad got in 1961! So cool! After these fantastic presents it was time to sit down for the last flight. Here we had the legendary "perfumebottle" from Tomintoul and just to mess a little with the ones that took a peak at the bottles before the tasting I switched the order of number 3 and 4. There were quite a few that said that number 4 was corkdamaged as it smelled of moss and earthbasement, but number 4 was the Tomintoul and it has a plastice screwcap! So it wasn't corkdefect that made it bad, but bad it was anyway! The rest of the flight was OK, no really good one but enjoyable whiskies anyway with one big exception. Number 7 was quite closed on the nose, just some vanilla and some grain, but the taste was soap, soap, soap and a little schampoo. Isch! I don't really know what have happend, as a 35 year old Dufftown from 1965, bottled in 2001 in the Old Malt Cask serie shouldn't taste like this. I can't see that Douglas Laing bottled something that bad in OMC in 2001. Luckily enough it was number 7 of 8. 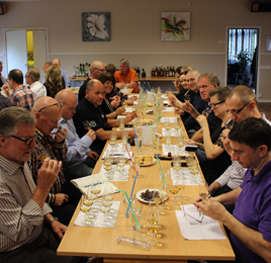 The winner was the Tomatin with the Invergordon as number 2 and Knockando as a surprising number 3. 24 bottles of whisky from 1965, a 12-year old bottled 1977, an armagnac and a calvados from 1965 were now all enjoyed and everyone was wuite satisfied with the day, but a party can't end at 10 PM! No, now it was time for some afterparty. The bar was filled with bottles from my whiskycabinet and the party could continue. Fogass took charge of the music (as usual), Thomas, Mattias and others took care of the dishes so I could take my time talking to my guests/friends and have a cigar with some of them. I opened a bottle of Quint Do Noval Port from 1963 (bottled in 1965) to go with the cigar. A magic combo! 4 hours later the last guests went hom and I could go home and sleep after a most satisfying day. 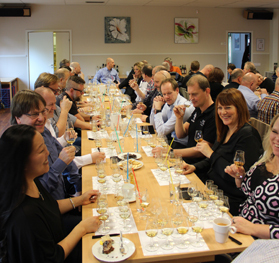 Whisky for about 200.00 SEK was emptied, but this day was not about value of bottles, it was about value of friends! Once again a great thanks to all my wonderful friends that came and made this day so memorable!